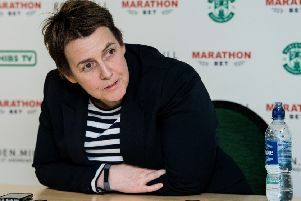 Paul Heckingbottom tasted defeat for the first time as Hibs boss as the man he replaced at Easter Road, Neil Lennon returned to keep Celtic on track for a third successive treble. Lennon succeeded where his predecessor Brendan Rodgers had failed, the new Leicester manager having never enjoyed a Celtic victory in three visits to Easter Road, second half goals from James Forrest and ex-Hibs midfielder Scott Brown giving the Glasgow side what, in the end, was a comfortable victory and a place in Monday night's draw for the semi-finals of the Scottish Cup. Hibs had to survive an early scare, Vykiintas Slivka losing possession to Scott Brown who immediately played the ball into the path of Oli Burke in the inside left position. The striker fired in a shot across Ofir Marciano but the goalkeeper pulled off a great save, throwing himself to his left to push the ball away with Paul Hanlon alert enough to mop things up before Scott Sinclair could capitalise. As expected, Celtic were enjoying the bulk of possession in the opening stages but a clever ball from Slivka allowed Marc McNulty to cut in from the left. The angle was against him and Scott Bain made a comfortable save at his near post. Hibs striker Flo Kamberi went down under the challenge of Kristoffer Ajer but his appeals for a penatly were in vain, the correct decision by referee Willie Collum. Celtic broke at pace as Kamberi got back to his feet, James Forrest playing the ball in for Odsonne Edouard who found his feet going from under him as he tried to round Marciano. There had been few goalmouth incidents in a first half in which the two sides cancelled each other out but Hibs returned after the interval full of purpose, a McNulty header breaking off Ajer and away from Daryl Horgan before the Easter Road winger set the striker running only for his low shot to go straight at Bain in the Celtic goal. The Celtic fans - and players - were raging when Lewis Stevenson caught Burke as he charged towards the Hibs penalty area. It was inches outside the box but referee Collum, much to Stevenson's relief, wasn't interested. But that was all forgotten when Forrest was allowed the time and space to stride forward and unleash a right footed shot from almost 25 yards which flew into the top corner of Marciano's net. And former Hibs midfielder Brown put the tie beyond Hibs as he stepped onto the ball and slammed a fierce shot into the roof of the net from just inside the 18-yard line. Hibs: Marciano, Gray, McGregor, Hanlon, Stevenson, Omeonga (Shaw 77), Slivka, Milligan (Bartley 63), Horgan (Mallan 63), Kamberi, McNulty. Substitutes not used: Dabrowski, Bigirimana, Mackie, Allan. Celtic: Bain, Lustig, Boyata (Toljan 85), Ajer, Tierney, Brown, Bitton, Forrest, Edouard, Sinclair (Johnston 77) , Burke (Henderson 90). Substitutes not used: Gordon, Hendry, Hayes, Weah..